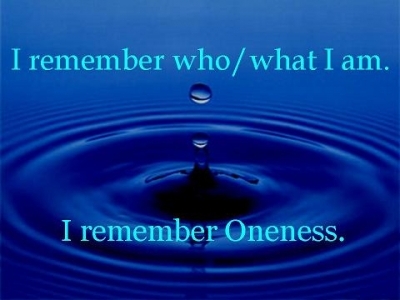 ONENESS–individually we strive to attain it, but what does it mean? It’s not a simple answer, for the term can mean many different things to different people. Collectively we are one humanity, one species, with a common evolutionary destiny. Our origins are the same and our interconnectedness on a human level is without question. Yet, on a higher level, we are more than one humanity, we are the universal “I”. I recently got to experience this in a rather profound sense. I had just attended a week of intense meditation work in Arizona, and as I was driving home I felt a shift. I looked out my driver window at all the hundreds of cars speeding along to their unknown destinations and I felt an overwhelming oneness with the drivers and passengers in each and every vehicle. This is not something most Los Angelenos can ever admit too. It is a battleground every day on our city’s congested freeways. But on that particular day (due to all the meditation, I’m sure) I became aware that every car was filled with other “Kathys”. There was Kathy in one car experiencing being in the body of a male (a rather buff one, I might add); there was Kathy in that Prius driving like a jerk trying to get ahead of everyone else; there was Kathy in that big semi-trailer looking bored and extremely tired and unhappy. Wow, I thought! This was quite a new perspective. Suddenly, I had greater compassion and understanding for all those other Kathys. They were me in all my multi-facets navigating this thing called “life”. It didn’t end there. I stopped off to buy water and came upon a man, dressed as a beggar, both homeless and penniless, needing food. Better give Kathy some money, I thought–so I did. With this sense of Oneness there was no way I could be dismissive or over-reactive to what my fellow man ever did. Every one of them was me experiencing life in its many forms. We are in this together. It was very enlightening. While that intense sense of Oneness has slightly faded, I am still aware of this inter-connectedness we all share. I practice it in crowds to see how all my other parts are doing. Like neurons making connections at rapid speed, we are a human internet—a Global Brain. We are ONE.